Red is the Reid Headwall. Green is our ski descent. I wrote something to Jason along the lines of, "No ski mountaineer worth his weight in explosive diarrhea would waste this week." A winter weather window is not to be wasted. I wrote something to Jason along the lines of, "No ski mountaineer worth his weight in explosive diarrhea would waste this week." Somehow he managed to get the day off work. Jeff was interested in the climb and willing to drive. I'd been working him with talk of Hood for a few weeks. 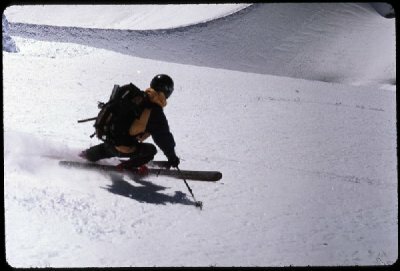 Jason skis freeheel above the Hogsback. 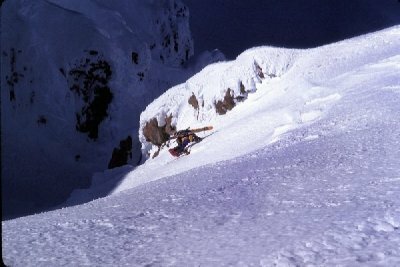 Jason climbs the Reid Headwall. 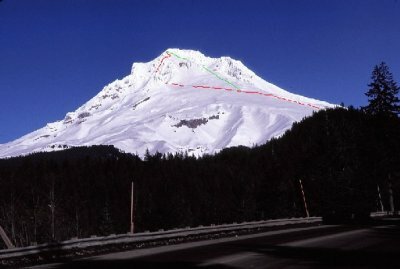 I had big plans for the west side of my good friend, Mt Hood. The mountain reminded me that I was an imposing visitor, barely tolerated, with an all-day barrage of strong wind. The wind had not left the Reid Headwall untouched. Jason and I didn't need to talk to know our big ideas of multiple routes were for another day. There was no disappointment after crossing the ridge to the west side of the crater, though. The sun was softening the icy snow on the steep slopes with their southern exposure. 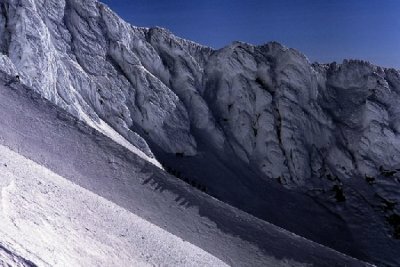 I've wanted to ski the classic steeps on that side of the crater since I climbed that way my first time up Hood. We went home satisfied, both Jason and I were impressed with Jeff's traverse around the crater. 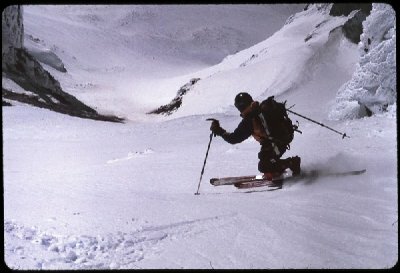 He even made some turns next to the Hogsback. Way to go, heifer, two thumbs up! Jason teles on the firm corn of the West Crater. Sky doesn't ski any more. He just works on his website.